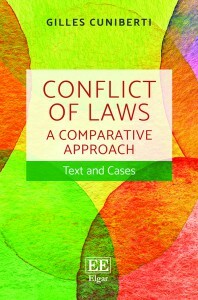 Professor Gilles Cuniberti (University of Luxembourg) has authored a casebook entitled “Conflict of Laws – A Comparative Approach” which will be released this month by Edward Elgar Publishing. “The Conflict of Laws, also known as private international law, is a field of the greatest importance in an increasingly globalized world. The analysis of any legal issue, in a case involving more than one country, must start with an assessment of which court could potentially hear the case and which law it would apply. Contrary to other manuals or casebooks, which focus on the law of one jurisdiction, this innovative casebook offers a comparative treatment of the field. On each issue, materials from several jurisdictions are discussed and compared. The approach centers on comprehending the common principles of the field, but also highlights the fundamental differences. The goal is to train lawyers who not only will know the law of their own jurisdiction, but also will have an understanding of the key differences existing between the main models, and will thus be able to interact usefully with clients from other jurisdictions. This casebook systematically presents and compares the laws of four jurisdictions: the United States, the European Union, France and England (where left untouched by EU harmonization). It offers additional insight into rules applicable in China and Japan and also discusses remarkable solutions adopted in a wide range of jurisdictions such as Italy, Germany, the Netherlands, Canada and Tunisia. All materials from non-English speaking jurisdictions have been translated into English. Further information, including a table of contents, is available on the publisher’s website. Next post: Conflictoflaws.net is back!